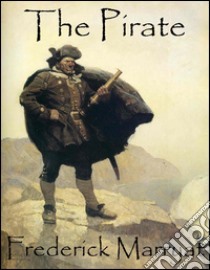 The Pirate by Frederick Marryat, first published in 1836. Among the few subjects which are still left at the disposal of the duly-gifted writer of romance is the Pirate. Not but that many have written of pirates. Defoe, after preparing the ground by a pamphlet story on the historic Captain Avery, wrote The Life, Adventures, and Piracies of Captain Singleton. Sir Walter Scott made use in somewhat the same fashion of the equally historic Gow—that is to say, his pirate bears about the same relation to the marauder who was suppressed by James Laing, that Captain Singleton does to Captain Avery. Michael Scott had much to say of pirates, and he had heard much of them during his life in the West Indies, for they were then making their last fight against law and order. The pirate could not escape the eye of Mr. R. L. Stevenson, and accordingly we have an episode of pirates in the episode of the Master of Ballantrae. Frederick Marryat (1792–1848) was Royal Navy officer, and acquaintance of Charles Dickens.